Culms: Erect, occasionally bent at base, coarse, glabrous. Blades: Flat or slightly keeled, 3 to 16 inches long, 1/4 to 3/4 inch wide, glabrous or scabrous, margins rough, midrib prominent beneath, tip tapering to long point. Sheaths: Round, glabrous, sometimes purplish, usually longer than internodes or the upper are sometimes shorter, prominently air-chambered. Ligules: Thin papery membrane, pointed or rounded, tip entire to torn. 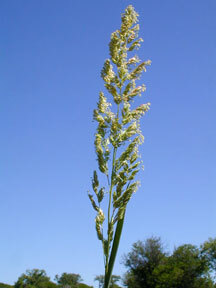 Inflorescences: Panicle, 3 to 7 inches long, .4 to 1.5 inch wide, dense, narrow, spreading during flowering, contracted later, lobed or interrupted, often reddish or purplish at flowering, straw-colored to whitish in fruit. Spikelets: Occur in clusters on short ascending branches, crowded, lanceolate, about .2 inch long, pale, glabrous to pubescent, 3-flowered; florets 1 fertile, 2 sterile; glumes nearly equal, ovate to lanceolate, narrow, rough, 3-nerved, greenish-white to purplish, becoming straw-colored, tips pointed; fertile lemmas lanceolate, shiny, tan, glabrous or with light pubescence, awnless; sterile lemmas reduced to minute hairy scales. Habitat: Wet places; river banks, ditches, stream and pond edges. Origin: Native to temperate North America, Europe, and Asia. Forage Value: Good to fair forage for livestock and good hay when cut prior to maturity. Produces large yields. Also used for silage. Uses: Waterfowl will nest in it. Native Americans made mats from reed canary grass. Comments: Reed canary grass is strongly rhizomatous cool season grass that grows in large clumps 2-3 feet across. It is aggressive and may dominate wet areas. The seed is difficult to harvest due to shattering.